From dreamy and delightful to fast and flavorful, travel our region for some surprising new innovations in far east cuisine. DIXON – This Dixon restaurant wins my award for one of the most beautifully displayed experiences. The interior, menu design and plated selections were all well planned…BRAVO! From soups, curries, noodles and entrées to a full sushi bar where you can catch the current sporting event, you will want to visit often. We started with the Crispy Thai Samosa appetizer and a Tom Kha Gai coconut-based soup – delicious! Our entrées were large, gorgeous portions of Pumpkin Curry w/Prawns and a Lemongrass Chicken. Both were outstanding and each were filled with surprising flavors that we will surely be back for. View their full menu online and call ahead for take-out, or dine-in Tuesday-Sunday. Closed on Mondays. VACAVILLE – Spice up your nightlife at Vacaville’s newly revived, old-style theater that really entertains. Roline’s Uniquely Filipino delights the front entrance with a full bar and tasty bites to enjoy while taking in a vast array of live entertainment. We jumped into karaoke night where the front bar quickly fills with warm, friendly and super talented locals. 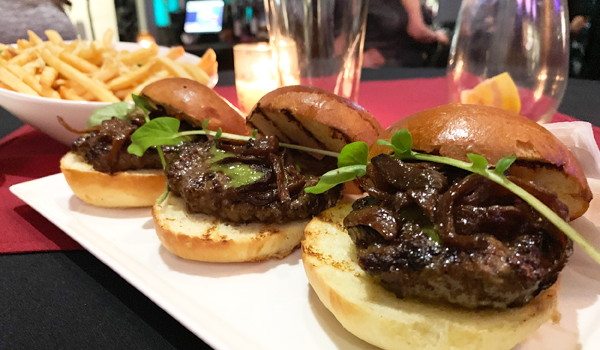 The mouthwatering Hache Brioche Sliders (3 mini grass-fed burgers w/caramelized onions and house-made Chimichurri) were a special treat! We also ordered Garlic Fries w/Parmesan as well as Lumpia (pork, veggies w/house-made sweet chili sauce). Items range from $8-15. This unique theatre is a great place to meet new friends and liven up your nightlife any day of the week. Bar opens at 4pm Monday-Saturday, 3pm Sunday. 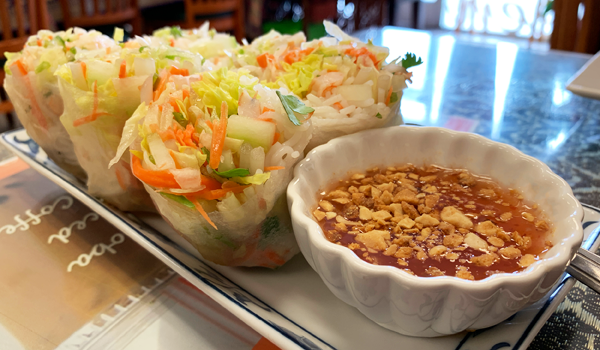 SUISUN CITY – A Suisun favorite tucked away just outside of downtown, this family-owned restaurant spoils you with their traditional style Thai selections. We started with the Fresh Spring Rolls with shrimp and a tasty peanut dipping sauce as well as the Pad Se Ew with chicken, pan-fried flat rice noodles, egg, broccoli and carrots. The dish was hot, healthy, filling and delicious! We topped off our dinner with an order of Pad Pak, available with or without meat. For dessert, we indulged and ordered the Fried Bananas and Ice Cream. It was the perfect ending to our meal! Lime Leaf is a great option with to-go orders and vegan/vegetarian options ranging from $6.99-13.99. Open for lunch & dinner daily, 11am-3:30pm and 4:30-9pm. With several meat, tofu and veggie options to choose from, you can keep the family healthy and happy without the cleanup! Choose from appetizers, meat bowls, sides and sauces where you’re welcome to mix and match your favorites. We started with appetizers of edamame and pot stickers, then feasted on orders of lightly fried Tofu Teriyaki with noodles and assorted vegetables; broccoli, zucchini, cabbage and carrots. 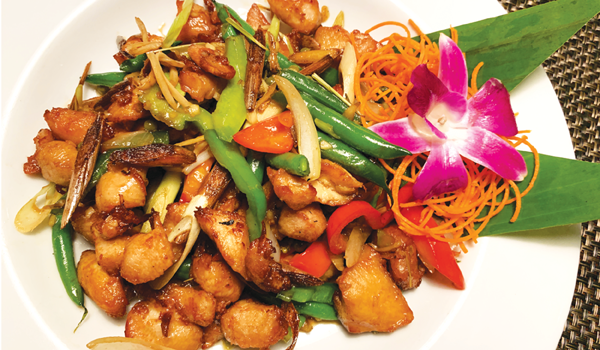 We also ordered the delicious Chicken Breast Teriyaki with white rice and fresh steamed assorted veggies. 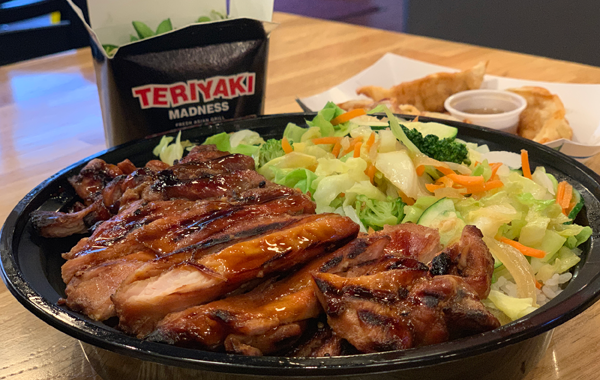 Try Teriyaki Madness in Fairfield next time you’re on the go. They’re open daily, Monday-Saturday from 10:30am-9pm and Sunday 10:30am-8pm. Brandy Hart writes “Tastes of Your Town,” a monthly feature in the print edition of Your Town Monthly. This article was originally published in the April 2019 Solano and Yolo County print editions.